Nothing is more frustrating than waiting with your hand under the tap for your water to get hot, which is why Clear Flo Plumbing only installs hot water heaters from trusted name brands. At Clear Flo water heaters are our specialty and we can help you select a size and type of water heater that is perfect for your family’s needs. When you rent a water heater from Clear Flo Plumbing, installation, repairs and maintenance are all covered under one easy monthly payment. Since 1874, AO Smith has been a manufacturer of quality products. From their origins as a small business in Milwaukee to a global producer of heating products, AO Smith has been commited to taking care of their customers. 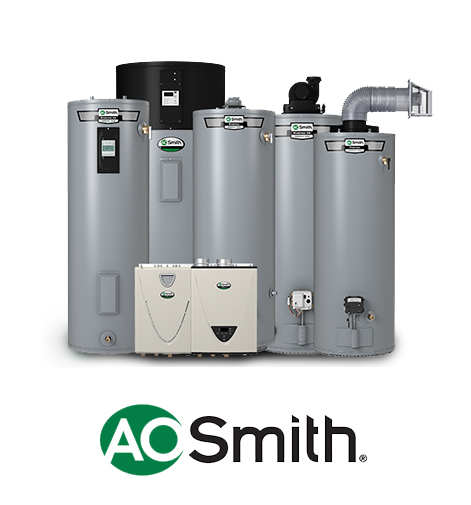 Today, AO Smith is the largest manufacturer of water heaters in North America, but they haven't forgotten their humble beginnings, commitment to quality products and passion for taking care of their customers. 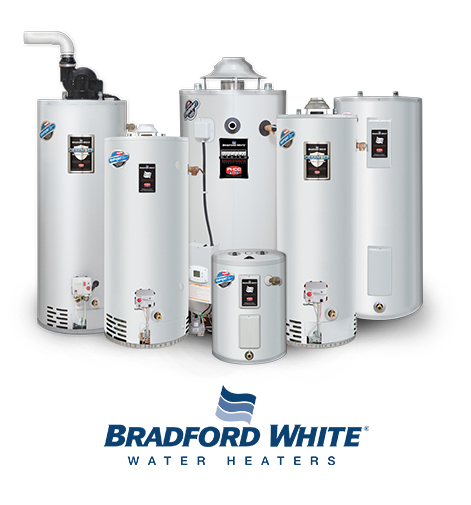 As an industry leading hot water heater manufacturer, Bradford White has been building high-quality boilers and hot water heaters since 1881. Bradford white has a wide range of products including natural gas, electric, high efficiency and tankless models all available from Clear Flo Plumbing. 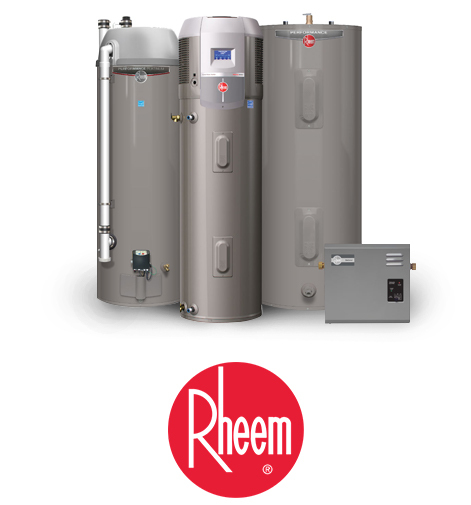 Based in California, Rheem is an internationally known manufacturer of heating and cooling technology. 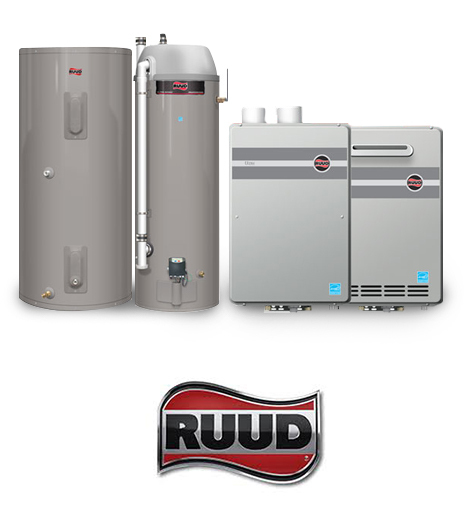 They have consistently provided award-winning hot water heater innovations since 1925. Today their line of products includes electric, gas, high efficiency and tankless models, all available from Clear Flo Plumbing. If one thing can be said about Ruud it's that they know HVAC. Over a century ago their very first product was a water heater and they've spent the last hundred years innovating and developing a full line of highly reliable heating and cooling products. Their water heater line has expanded to include electric, gas, tankless and hybrid water heaters, all of which are available from Clear Flo Plumbing. Customers love gas water heaters for their low operational cost and heavy duty cycle. Clear Flo Plumbing carries gas water heaters from a variety of reputable name brand manufacturers for installation in your home. If you've got a lot of people taking a shower every morning, gas might be the best choice for you. Without gas lines, an electric water heater can be installed in virtually any room of the home safely. Electric water heaters are also more environmentally friendly and come in a variety of sizes. Clear Flo Plumbing installs electric water heaters from a number of name brand manufacturers. Tankless, on-demand or instant hot water heaters are a great option for some families who are hoping to save money and space. They typically consume between 30% and 50% less energy than units with large tanks. Typically running on natural gas or LP, they offer a continuous supply of hot water. Clear Flo Plumbing carries tankless water heaters from name-brand manufacturers ready for installation in your home. Contact Clear Flo Plumbing for a full and updated inventory of the water heaters we have in stock.